Heat the olive oil in a large saucepan over a low heat and gently fry the onions and garlic for about 10 minutes or until soft. Add the stock, increase the heat and bring to the boil. Add the beans and return to the boil. Cook briskly for 12 minutes or until the beans are meltingly soft. Remove from the heat, add the chopped sage and liquidise while still piping hot. Strain the soup through a sieve and stir in the crème fraîche. Season to taste with salt, pepper and, if you like, a pinch of sugar. If you are eating the soup straight away, reheat it now. Alternatively, you can cover and chill it until needed. 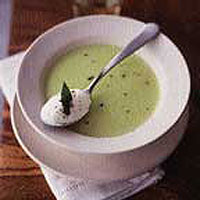 In either case, ladle into soup bowls, add a spoonful of crème fraîche and garnish with a sage leaf or a sprinkling of chives.